Liverpool captain Jordan Henderson wants Gareth Southgate to secure the England manager’s job for a long time. Henderson was skipper for Southgate’s second game in charge, a 0-0 draw in Slovenia on Tuesday after a 2-0 win against Malta on Saturday. Southgate, 46, has the job initially for four games after he succeeded Sam Allardyce in September. “The manager has been brilliant. The players have got on really well with him this week,” said Henderson, 26. Southgate – who said after the Slovenia game that he has “inherited a mess” – gave the Reds midfielder the captain’s armband after dropping Manchester United forward Wayne Rooney to the bench. He now has a World Cup qualifier against Scotland at Wembley on 11 November and a friendly against Spain four days later to persuade the Football Association to give him the job full time. “He gives responsibility to players and he listens. It’s been a good week,” said Henderson. 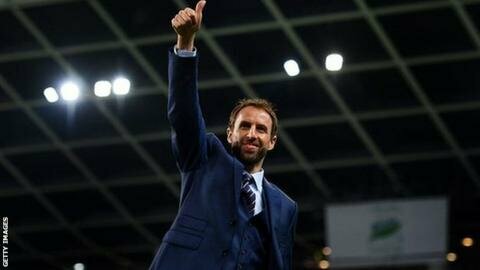 Southgate stepped up from his role as England Under-21 boss to take temporary control of the senior team following Allardyce’s departure. Allardyce, 61, left his post after just one game and 67 days following a Daily Telegraph investigation claiming he offered advice on how to “get around” rules on player transfers. That followed England’s disastrous Euro 2016 campaign, which saw Roy Hodgson resign after an embarrassing last-16 defeat by minnows Iceland.